The last post in this series showed that the main way in which waterjets penetrate into materials is by growing cracks that already exist within the material, and I used glass as an example to show that this was true. It is this process during which water penetrates into cracks, and then comes under pressure, either by the impact of more falling water (say under a waterfall in nature) or because the water freezes and then thaws, that causes the cracks in the rock to grow under natural attack, and the rock to slowly erode. As this happens the cracks slowly grow and extend to the point that they meet one another, separating small pieces of rock from the solid. Within the body of a piece of rock the largest cracks that exist are normally at the boundaries of the grains of different minerals that make up the bulk of the rock. (Back in 1961 Bill Brace showed that the strength of a rock reduced as the square root of the increase in the grain size of that rock ). ( Brace, W. F. (1961): Dependence of fracture strength of rocks on grain size. Bulletin of the Mineral Industries Experiment Station, Mining Engineering Series. Rock Mech. 76, 99± 103.) More recently, though still back in 1970, my second grad student, John Corwine, showed that it was possible to predict the strength of a block of granite, knowing the size of its crystals. Which makes a good time to tell a little anecdote. Back when I was doing my own doctorate at the University of Leeds (UK) we were looking at how waterjets drilled through rock, and how that might be used to make a drill. We had already run some tests of different rocks that we placed under a nozzle, and gradually raised the pressure of the jet to see what pressure it took to make a hole in the rock. Tests on granite had shown that the jet (with a maximum pressure of just under 10,000 psi) would not drill a hole into those rock samples, and so the granite had been set aside. But, with the equipment just finished and yet having to go to lunch, I asked Dennis Flaxington, the lab technician helping me, to put a new sample into the rig so that we could run a test in the afternoon. When I came back I found that he had used a piece of granite. I made several disparaging remarks, at which point he noted that, having spent some significant time putting the rock in the apparatus, I should just go ahead and run the test (which normally took about 5 minutes) rather than being an unmentionable. And so we did, and as I posted earlier, this is the resulting hole in the rock, which we were now able to drill right through in a process that took about half-an-hour. How could this now work, when a single jet clearly did not penetrate into the granite in the earlier tests? The answer is that as we moved the rock under the nozzle (we were slowly spinning the rock under the nozzle, and then raising the rock, since at the time there were no high-pressure swivels available for us to use) the jet passed successively over the edges of the different crystals in the granite. As it entered and pressurized these small fractures, the pressure in the crack was enough to grow the crack and remove individual crystals along the jet path. By starting at the center, and taking successive passes around the axis a large depression was cut into the surface, and the rock could then be raised, and a second smaller layer removed. Repeating this slowly removed the rock in front of the nozzle, and at the end of the test we had drilled through 9 inches of granite. From this experience, over time we went on to cut, for a University, a lot of granite. Obviously, to cut at a competitive rate we had to cut at a higher pressure that just 10,000 psi. But, after showing that we could cut Georgia granite at a competitive rate in tests run at 15,000 psi down in Elberton, Georgia, Dr. Marian Mazurkiewicz and I led a group of our students in cutting 53 blacks of that granite to form the MS&T Stonehenge that now sits on the University campus. Figure 2. View of the Stonehenge at Missouri University of Science and Technology, the vertical blocks are some 11 ft tall. The entire sculpture was cut by high pressure water jets operating at between 12,500 and 15,000 psi. (MS&T RMERC ). Cutting commercially is not quite as simple as it might appear, since larger blocks such as those shown in Figure 2 will contain rock that varies quite significantly in properties as the cuts progress. 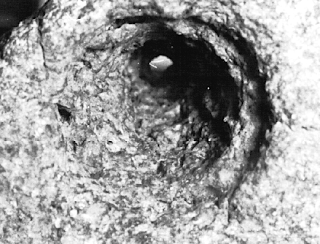 In the Stonehenge case the rock came from close to the top of the quarry, and the cracks in the rock were quite well defined. Some fifteen years later we were fortunate enough to be asked to cut a second sculpture, but this time working with the internationally acclaimed artist, Edwina Sandys. 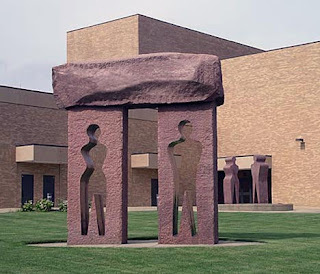 Edwina had designed a sculpture for the campus, the Millennium Arch, which required that we cut two figures from blocks of Missouri granite, and polish them to create one group, while using the original pieces as part of an Arch that would stand some 50 ft away. Figure 3. The Millennium Arch at Missouri University of Science and Technology. 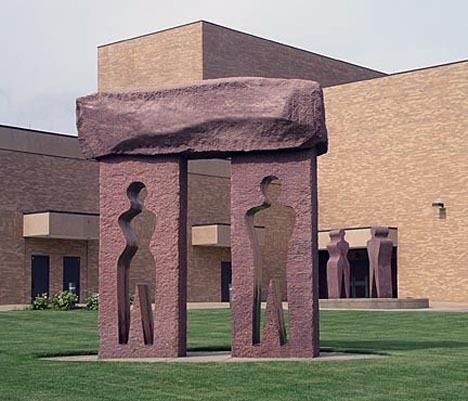 (Each vertical leg of the Arch is some 15 ft long, and the figures removed and in the background, are 11 ft tall). Better images can be found here. The vertical legs were first cut to shape, and then the figures cut out from them. In order to contain the crack growth to limit the amount of material removed the cutting lance had two jets inclined outwards and the lance was rotated at around 90 rpm, as the lance made repeated passes over the surface, removing between a quarter and half-an-inch of rock on each pass, until it had penetrated through the rock. It took 22 hours of cutting to isolate the female figure from the host block. The slot width was around an inch, and there was some significant difficulty in cutting this slot as the quality of the rock changed within the blocks being cut. (The problem was solved by raising the cutting pressure). Figure 4. Partial cut for one of the figures of the Millennium Arch, checking the depth. This second sculpture illustrates both an advantage and a problem for the use of waterjets in cutting rock pieces. Use of the water gives a relatively natural look to the rock, although the vertical surfaces of the arch and the capstone were all actually “textured” to look natural using a hand-held lance at 15,000 psi. (The rock is a little harder than that from Georgia and most of the cutting took place at around 18,000 to 20,000 psi). But when the polished surfaces for the inside of the verticals and the isolated figures were prepared the rough initial surface required much more time to grind and polish flat, than a smoother initial cut would have needed. Figure 5. 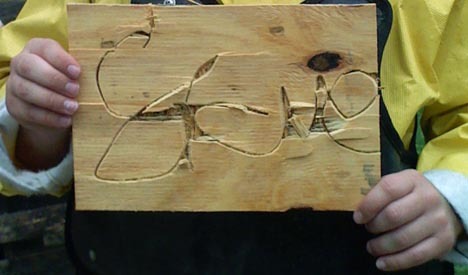 Student name written with a high-pressure jet into plywood. 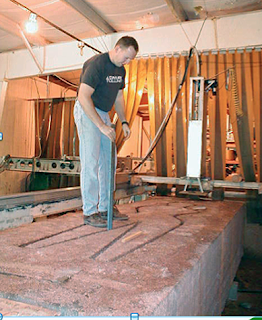 Note that areas of the wood around the jet path are lifted by water getting into the ply beneath the surface layer, and that part of the top ply between cuts is removed in places. I thought about having you guess the student name, Steve, but this is one of the more legible ones. (Female students generally cut the letters one at a time and were more legible, male students tried to write the whole name at once). There are many similar examples that I could use to illustrate that, while there are tasks where waterjets alone work well, when it comes to precision cutting, then adding a form of sand to the jet stream to provide a much more limited range to the cutting zone can give a considerable advantage, and so the field of abrasive waterjet cutting was born, and discussion of that topic will lead, in time, to a whole series of posts. I become very pleased to find this site. Did you know you can shorten your long urls with LinkShrink and get money from every visit to your shortened urls.